The Avatar Mountains are a massive mountain range system that occupies a large area of land on the east side of SW Island. It is also a designated region of Syntax Estates, using the number 590 as its area code. 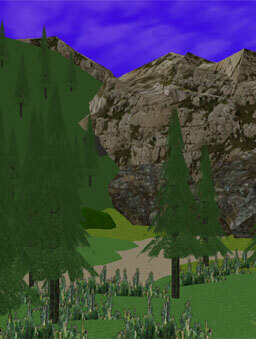 The Avatar Mountain Gorge is a massive gorge located on the south side of the Avatar Mountain range. Settled within the gorge is Terrax Swamp, a dense swamp region populated by marshy undergrowth and Ortonian Willow trees. Littered about the cliffsides of the gorge are ruins from an ancient Barsyn colony. The Avatar Mountains two highest peaks, the Draxenhorn and the Morax Summit, are a great challenge to any hiker or explorer. The mountain range is a popular place for local billionaires to establish extravagant residence due to the fact that a lot of the land was previously unused and had no important historical sites being preserved. Two SW City management members, Syntax and Ferruccio, both have rather large mansions situated in this region. A third mansion has been under construction since 2002 but has since halted due to the disappearance of the chief financier. The clearance of the land to prepare for the construction of the mansions was originally protested by residents of SW City as it would have a major impact on the surrounding environment. The voices of the people who protested were not heard, and the major land moving operation went ahead as planned. As predicted by the protesters, a few species of wildlife were driven away from the area and have not since returned.